Back in March, the Pasadena Star reported that artists had been invited to submit proposals for a design for artwork that would span the Foothill (210) Freeway, and help commemorate the San Gabriel Valley. Well, they've picked their winner--and he's based in Minnesota. Meet Andrew Leicester, 61. For his design, he plans to incorporate "artistic traditions from Native American tribes from the San Gabriel Valley, including the Chumash and Gabrielenos, and references to the region's native animal and plant life into a contemporary structure." According to his official bio, Leicester is an artist who has worked in the United States, the United Kingdom and Australia. You can see some of his projects here. 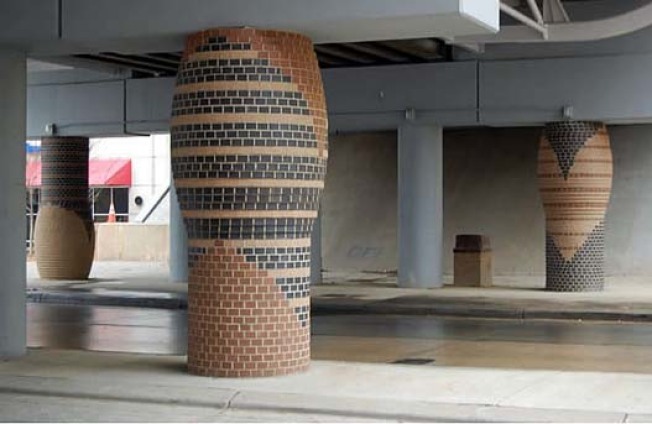 Pictured above is Leicester's work at a transportation stop in Charlotte, NC, according to his web site. Let's just hope this gateway art project doesn't get the same reviews as that recent NoHo art piece.